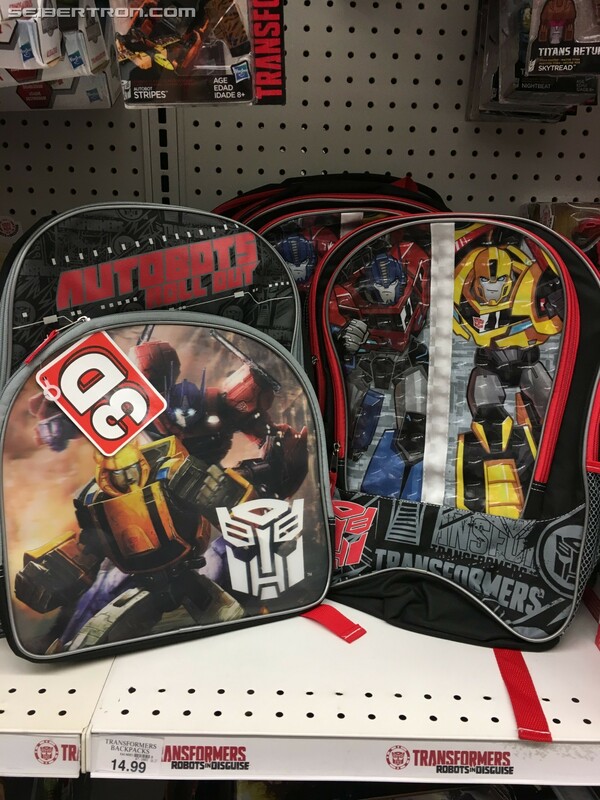 Our very own xRotorstormx found those Transformers Robots in Disguise backpacks and lunchbags that were just spotted in the new Toys R Us serial (plus a couple new ones) at a Michigan TRU and Walmart! 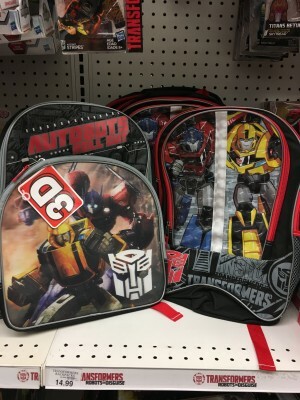 Along with the RID pack and the silver Autobot symbol lunch bag, she also found bags with artwork similar to standard Generations designs, plus an Autobot logo backpack! 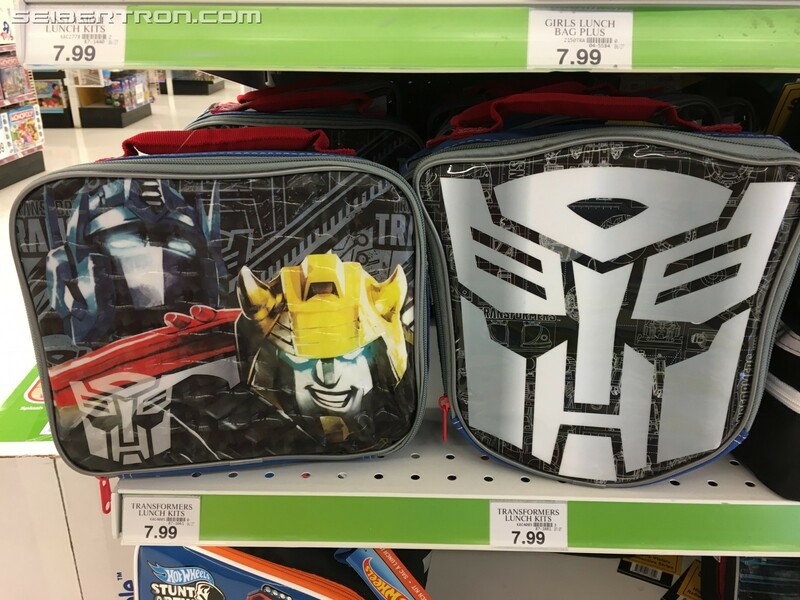 That generations Bumblebee on that lunchbag looks really up to no good with that expression. I don't trust him at all. Nope nope. 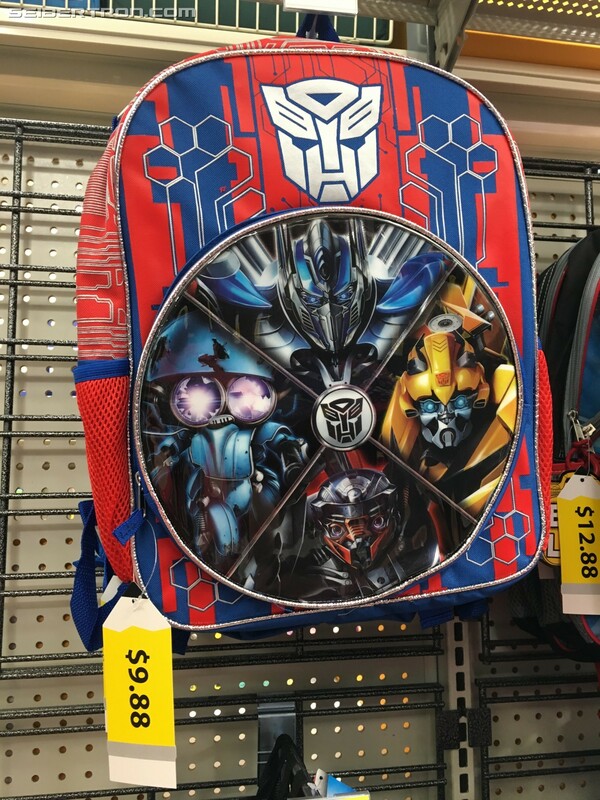 According to twitter it looks like a new Transformers themed snack is going to be hitting shelves. These will be made by the brand Signature Kitchens which is owned and sold by Safeway grocery stores. 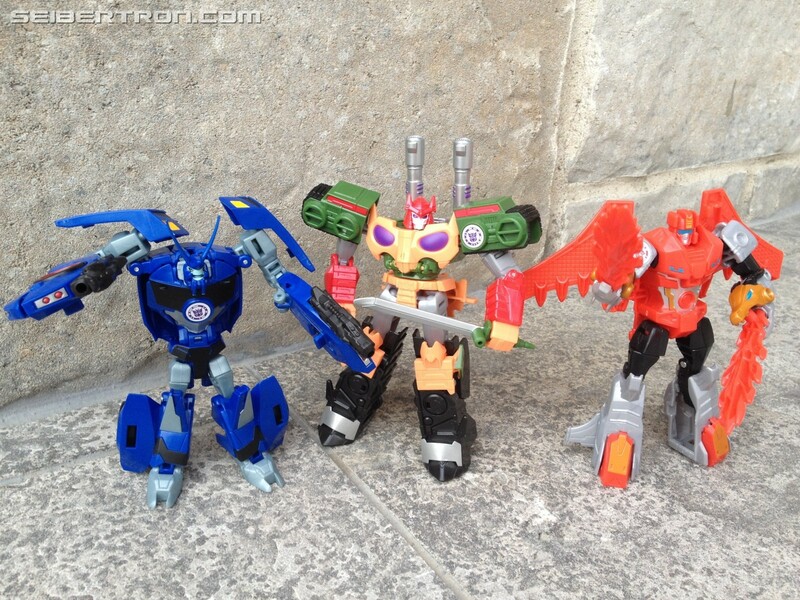 They come in fun shapes of Transformers: Robots in Disguise characters, shown below. 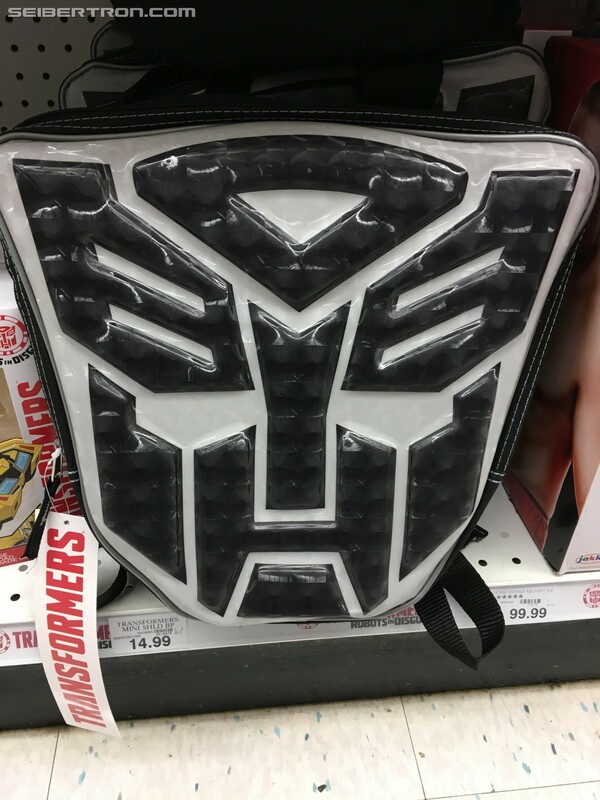 If you need a Transformers lunchbox to go with your snacks, have a look here. The first thing I thing I thought of when I saw this was that Filthy Frank video where the bald guy shouts "FRUIT SNACK! FRUIT SNACK!" Twitter just announced this now? I've been seeing these at the grocery store since at least last Christmas. Also Acme, Albertsons, Vons, Pavillions, Shaws, Jewel Osco! Just to name a few. They're all owned by the same patent company which unified it's store brand across all its banners. Somebody's got to bite the bullet fruit snack and give us a review of them. 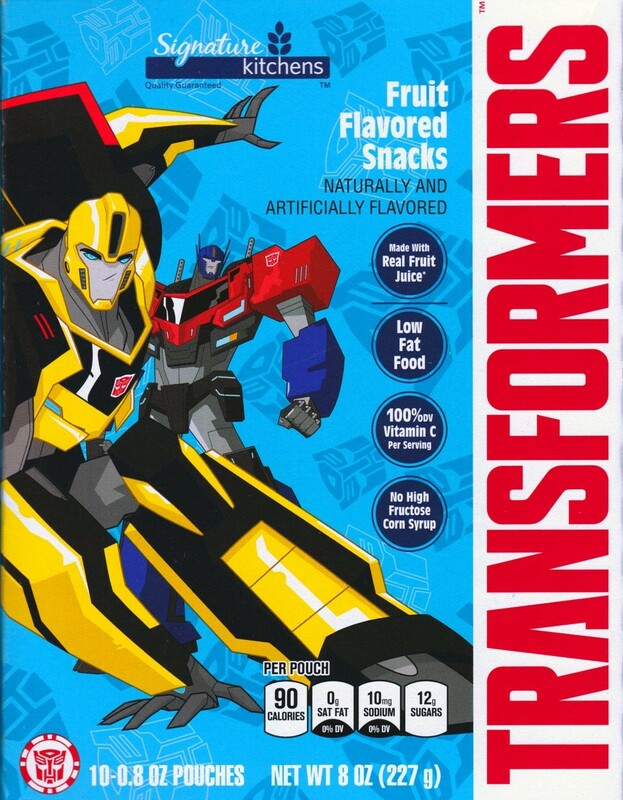 They're like every fruit snack out there: artificial flavoring, gummy texture, and only slightly less likely to get stuck in your teeth than traditional Gummy Bears (rest assured, they will get stuck, but only to a slightly smaller extent). The shapes are hit-or-miss; there are as many that look like the picture on the box as there are those that are barely-decipherable blobs. 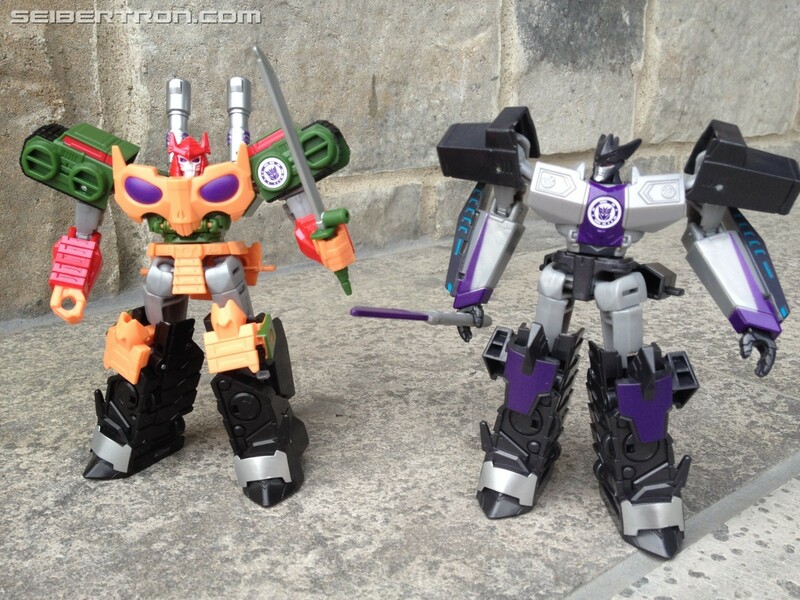 You won't learn any more about Megatron in RID15 by buying these than you will by looking at the above pic. That's not to say they're bad. It's just that fruit snacks are a dime-a-dozen product; if you've had one, you've had them all. 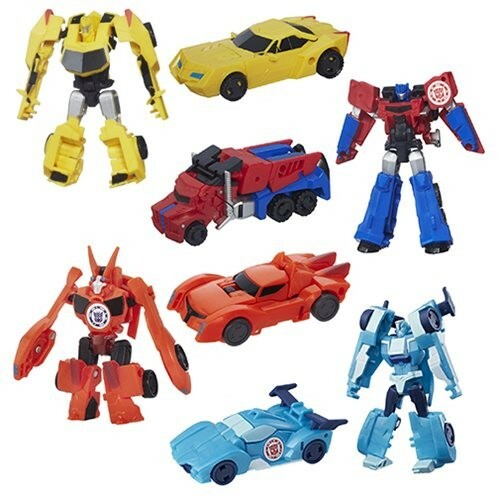 There is lots of new Robots in Disguise toys found both online and in stores for Canadian fans. 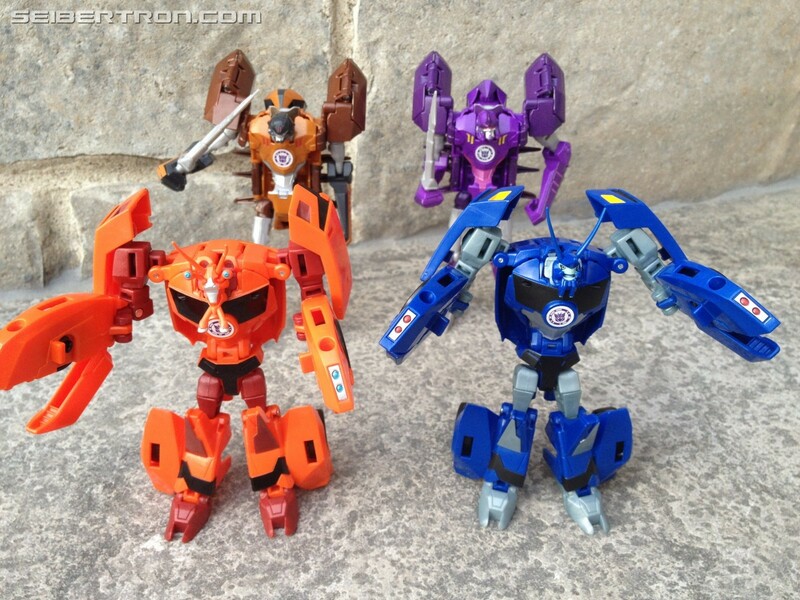 Canada had skipped on every Legion class wave under the "weaponiser" so toys like Bisk and Grounpounder never appeared. 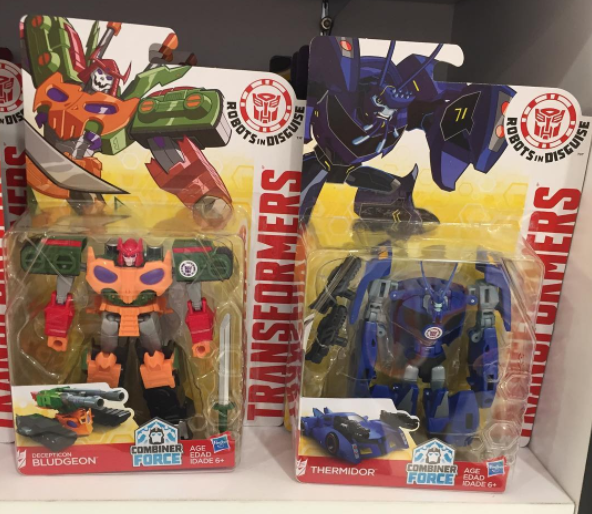 However, Bisk is rereleased with Blurr under the "combiner force" subline and is currently found at Toysrus. 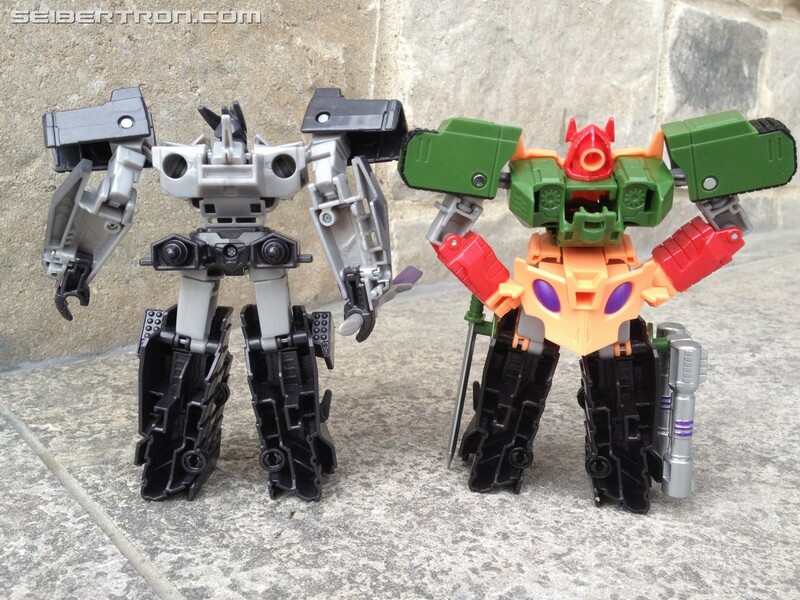 The same applies to the latest wave of Crash Combiners which includes Dragbreak Lunaforce Primestrong and Shocknado. They have ben found at both Walmart and Toysrus stores but only Toysrus.ca has them online at the moment. When it comes to Thermidor, this review, and images found within, will mostly be comparing him to Bisk. 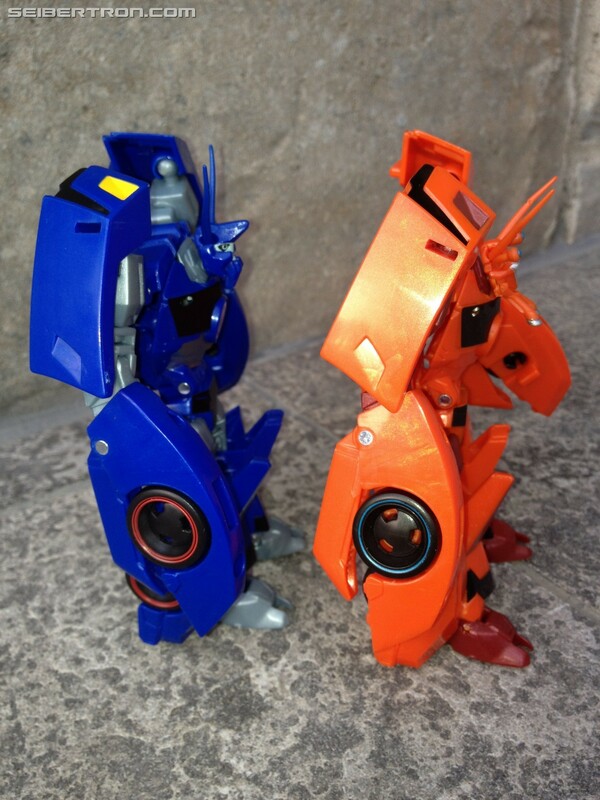 I'd love to review the toy as new but in reality he is similar to Bisk in every way aside from the head and deco. For those who do not own this mold, it is simply perfect. 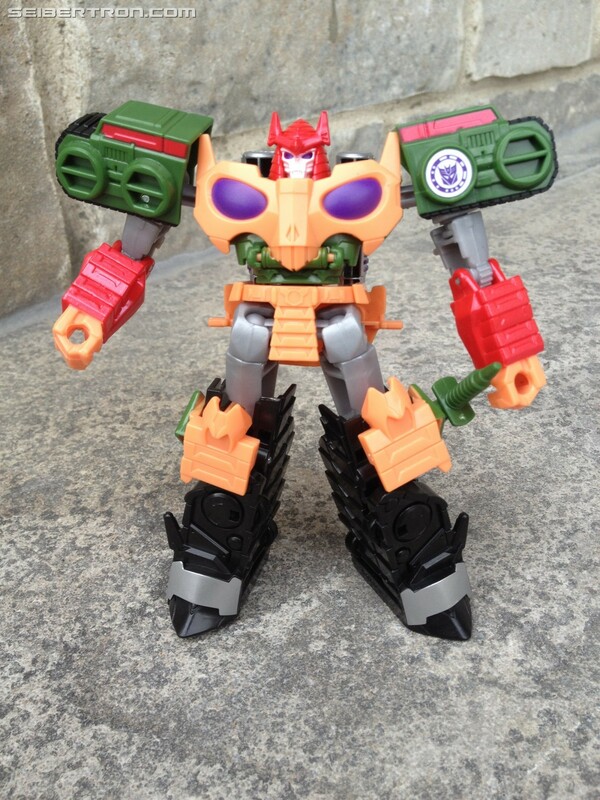 The alt mose is original, the robot mode has great personality with alt mode integration. 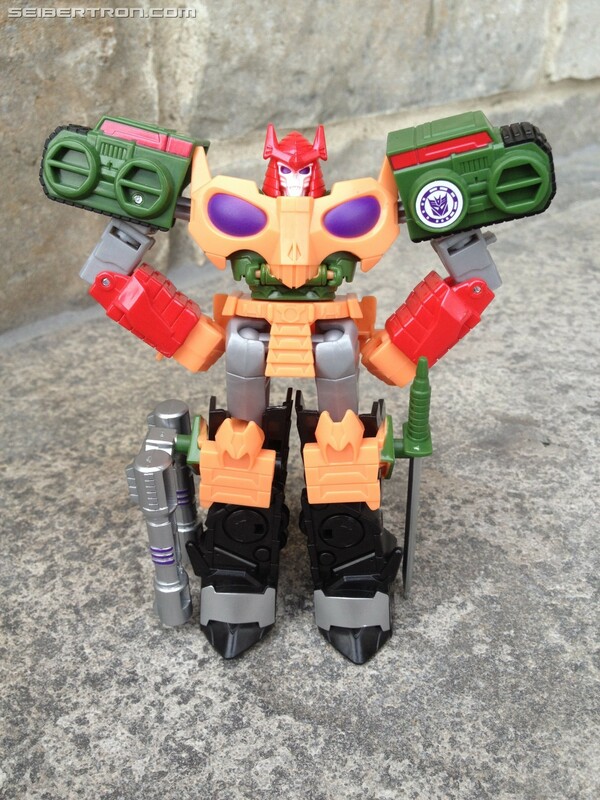 It's a fun transformation that is not at all bothersome and both intuitive and creative. 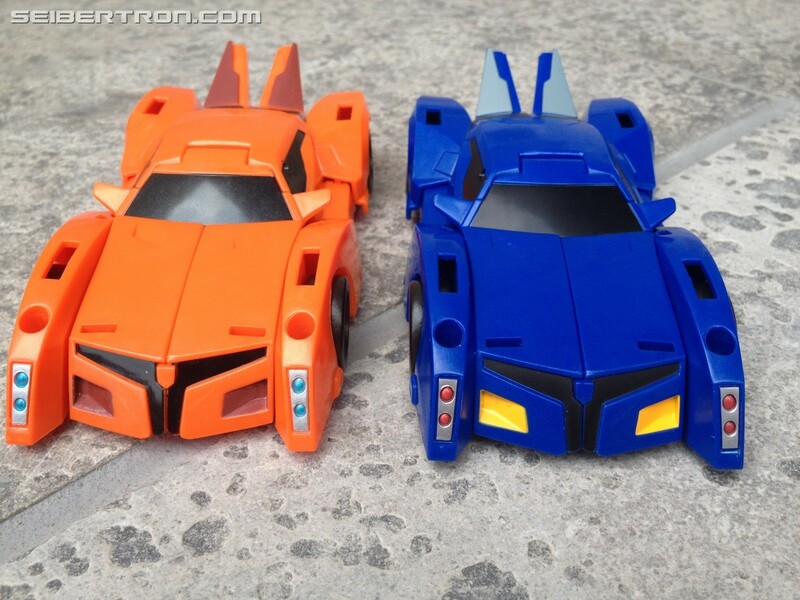 The real difference here is the deco and the head. The head has very features, he actually has pupils for a change. The deco for the eyes works rather well. The paint may be sloppy depending on your copy, especially in the lower mandibles. The amount of paint apps between both is almost the same but Thermidore wins out with having his whole abdominal area painted silver while Bisk's is left unpainted. 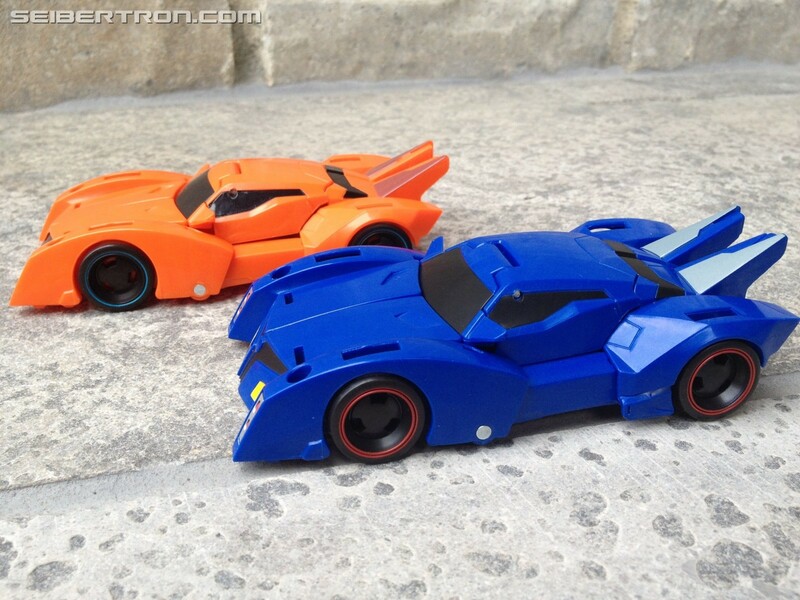 Also, I always appreciate when the rims are painted which is the case here so no need to wait for the Takara version here (not that it would happen). 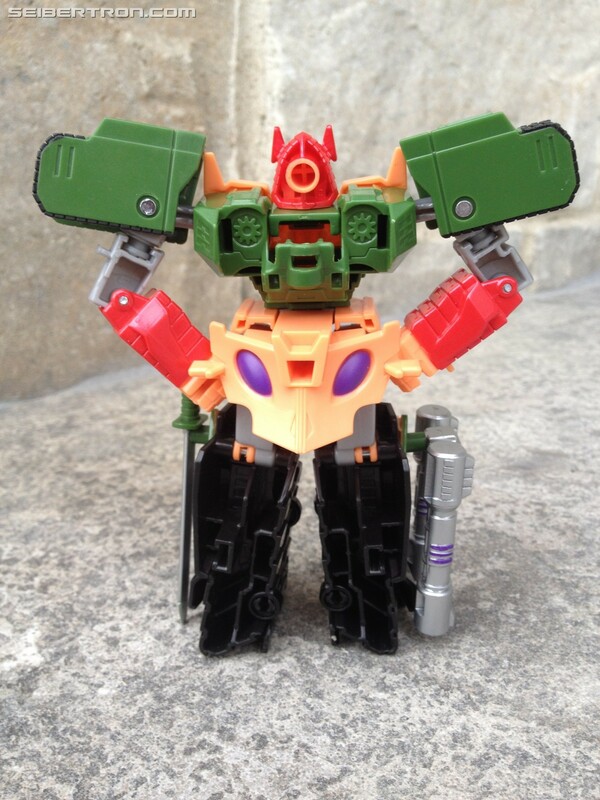 I recomend this toy to any fan of the Bisk mold and to those who have not experienced this mold yet, as well to those who want a nice representation of the character found in the show. I am happy with my purchase and there isn't much more I could ask for. 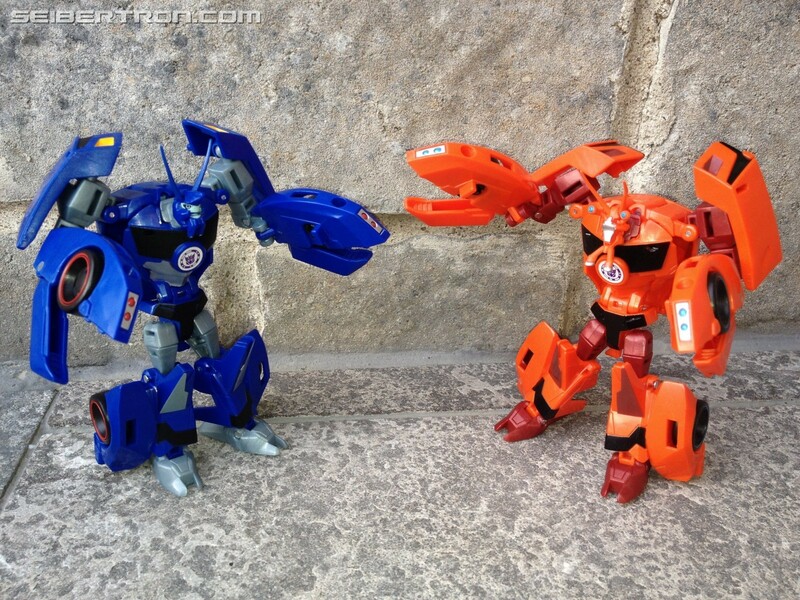 Heh, Thermidor is to Bisk what Cryotek was to Transmetal 2 Megatron. I like that Thermidor looks like he's ether happy or screaming depending on the angle you look at his face. Maybe this one's face won't SNAP OFF. Great mold though, these colors really work it. 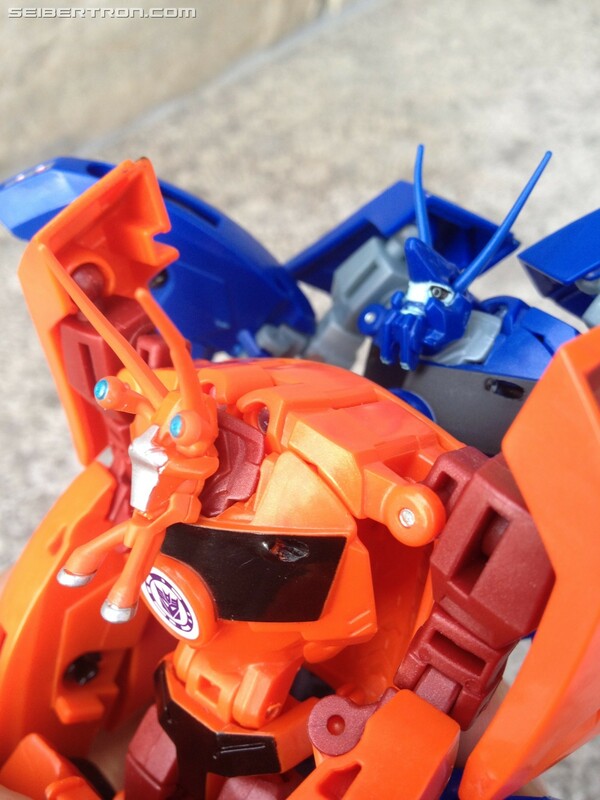 MaverickPrime wrote: That blue is GORGEOUS. It IS! 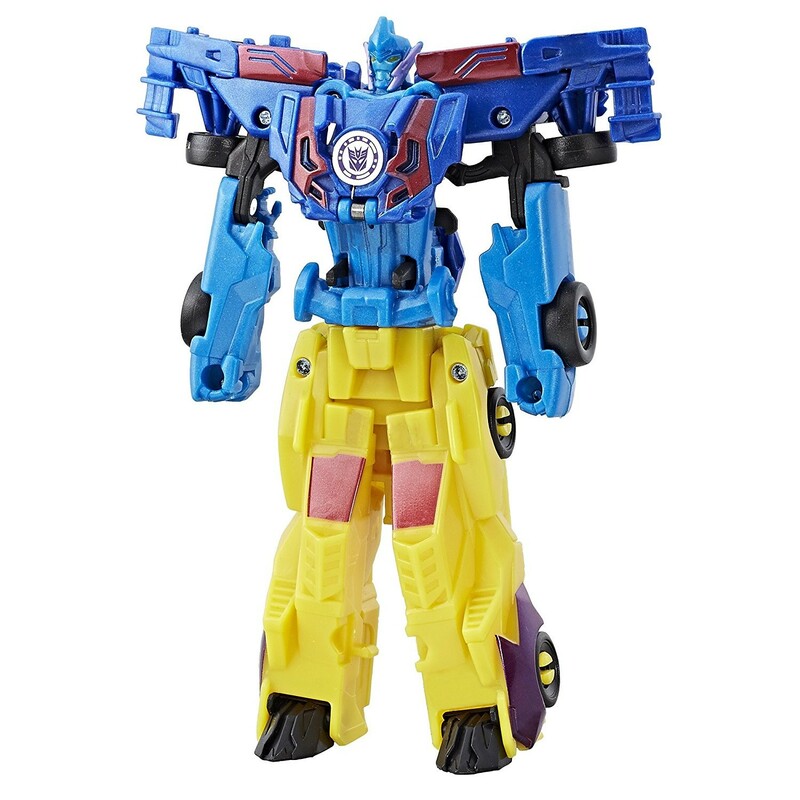 I have never seen such a full blue like this on TF plastic before. And the fact that only detailing on it is painted gives it a nice unifying look. Terrsolpix wrote: Maybe this one's face won't SNAP OFF. Great mold though, these colors really work it. It only snaps off when the "neck" piece is not locked in correctly. 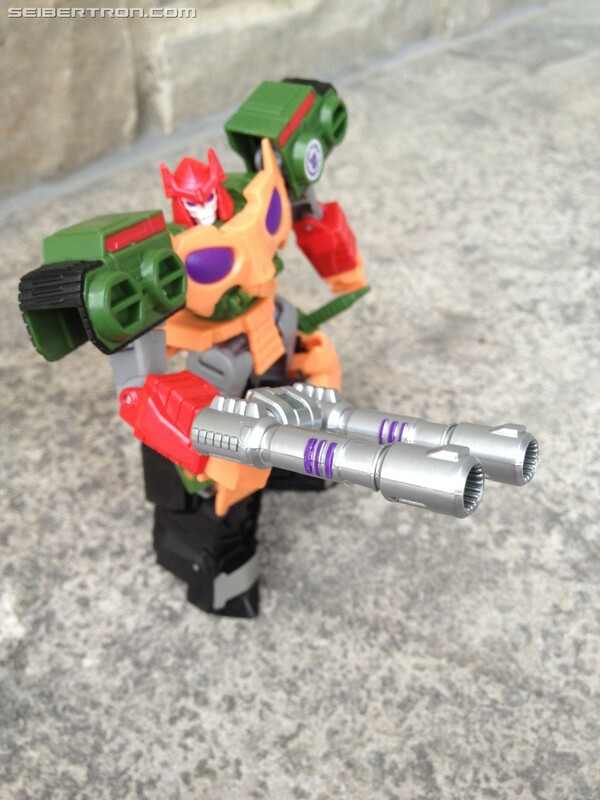 I short, Warrior Bludgeon is lots of fun and gets the job done. He of course has a few cons (heh) of his own but the pros far outweighed them. Now onto the full review! 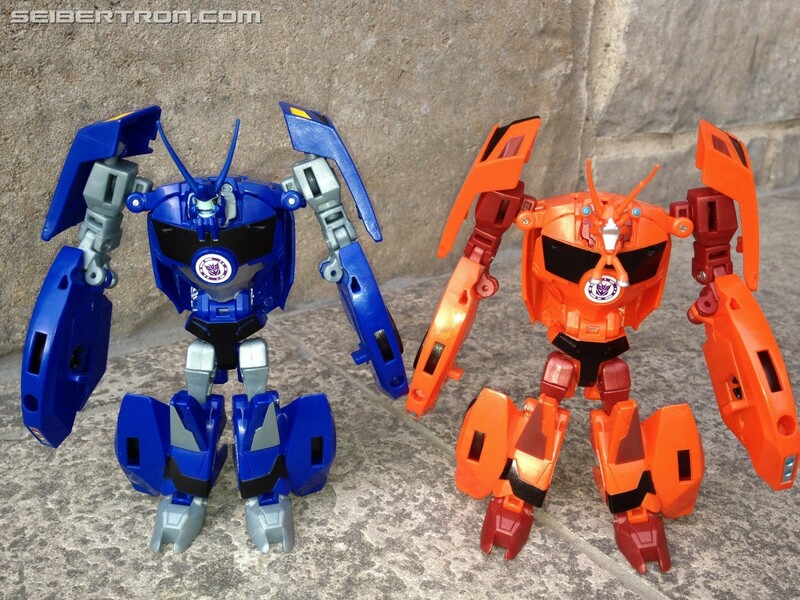 I do not know if you're like me but every single picture I see of a toy will never prepare me for the real thing. There will always be something I had not noticed. 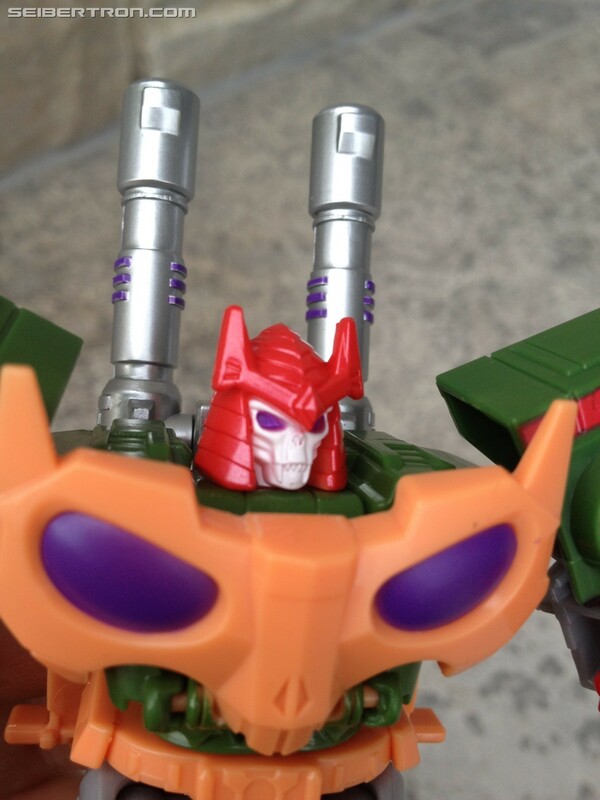 With Bludgeon, it is all about the head sculpt. There is a depth to it that no picture can show and I hope I will be able to demonstrate it this time. Firstly the centre of his helmet crest sticks out forward quite a bit. Then there are he's very very deep set literal cheek bones. It's now that we get to the cons. The depth also extends in the back but not in the best way. You see there is a peg they put there with the edge unpainted that is used for the alt mode and not to great success if I may add. 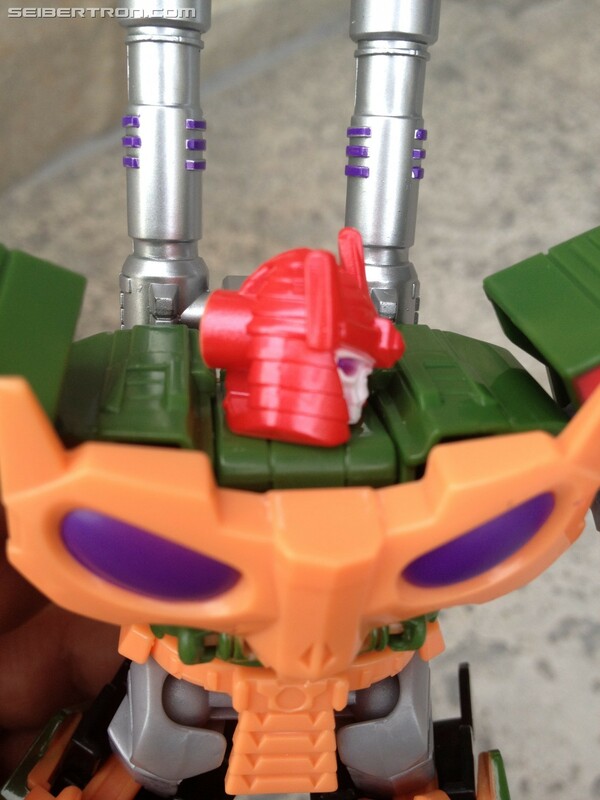 But that should not detract from the amazing headsculpt which I believe is the best we have ever gotten for a transforming bludgeon. Especially when you realize that it's mae of orange plastic, meaning that every other colour is painted. I also had not noticed the fangs which are very different from the artwork on the box which makes him look more like a Jack O Lantern. Another element I had not noticed was the point of the black outline on the shoulders. 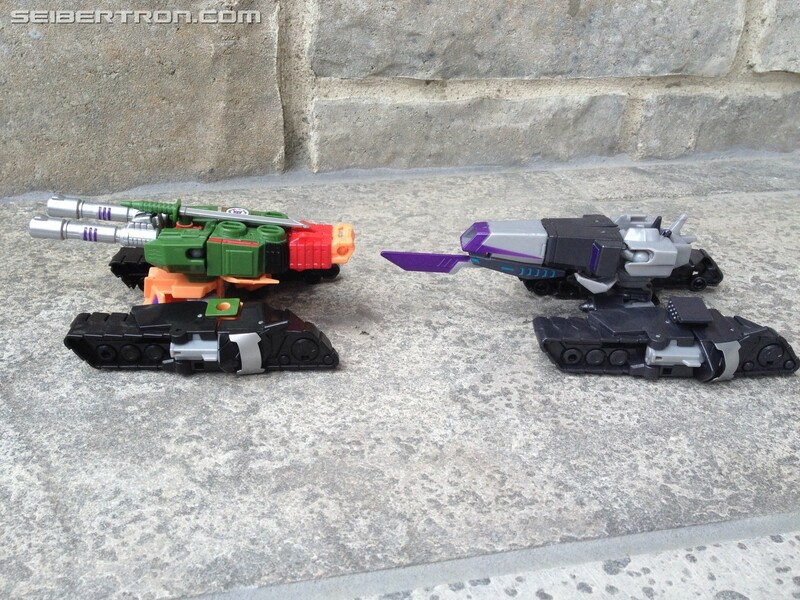 You see, they appear to be tank treards and since he turns into a tank we would assume that they would be used in the altmode. 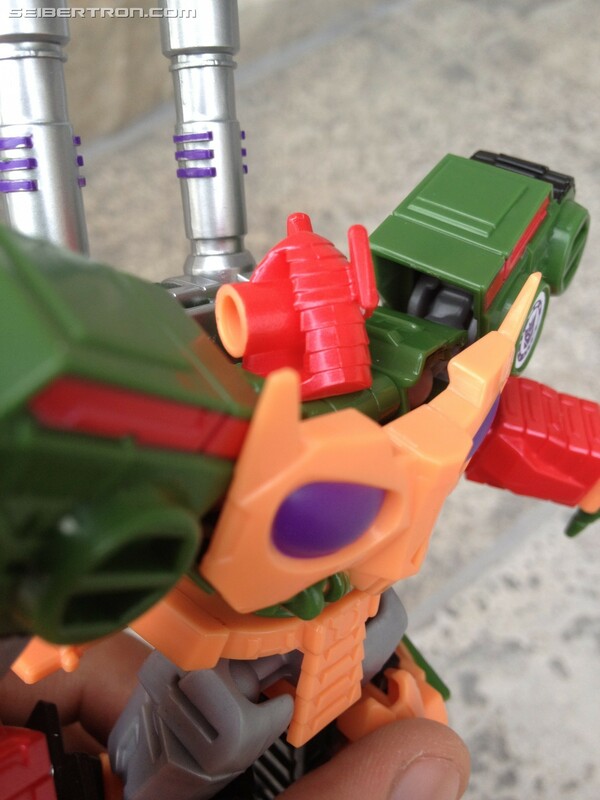 However those that own Megatronus (which is the base mold for Bludgeon) know that the shoulders were never part of the treads below. 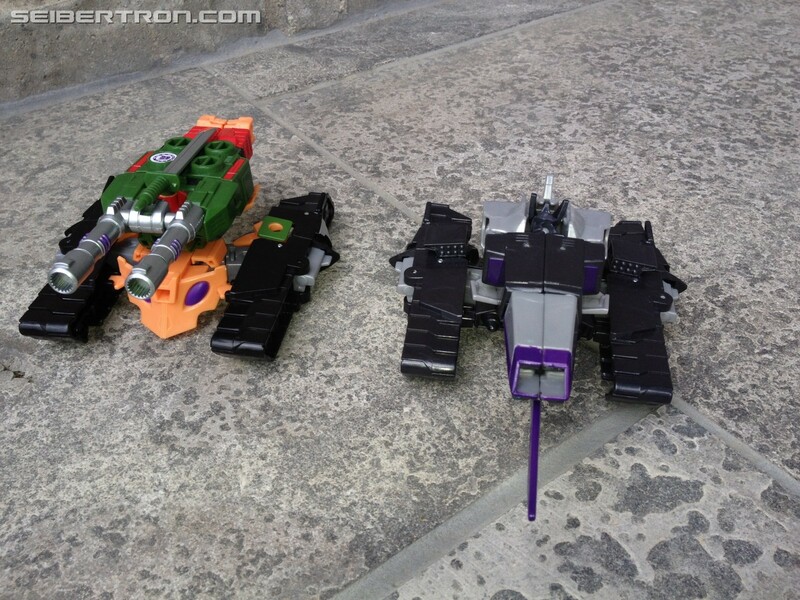 So the shoulder treads actually do not contribute to the alt mode at all and are simply there for the robot mode as an homage to the Revenge of the Fallen toy whos tank treads imitate Samurai armour. This was quite a fun revelation for me. We spoke of paint earlier I have no need for more paint aside from maybe the samurai skirt and the kneecaps as well as the teeth on his chest. His weapons can be weilded in very different ways. 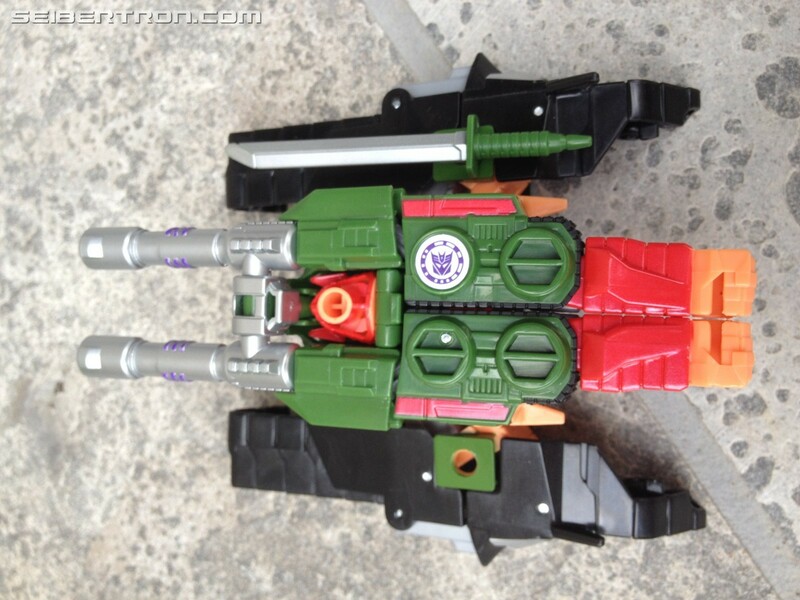 He has two cannons on his back à la Bruticus but they can actually be either become shoulder cannons or simply lowered in the back not to be seen. They can also be removed and used as a handheld weapon and even stored on the side of his legs were you have a peg hole. 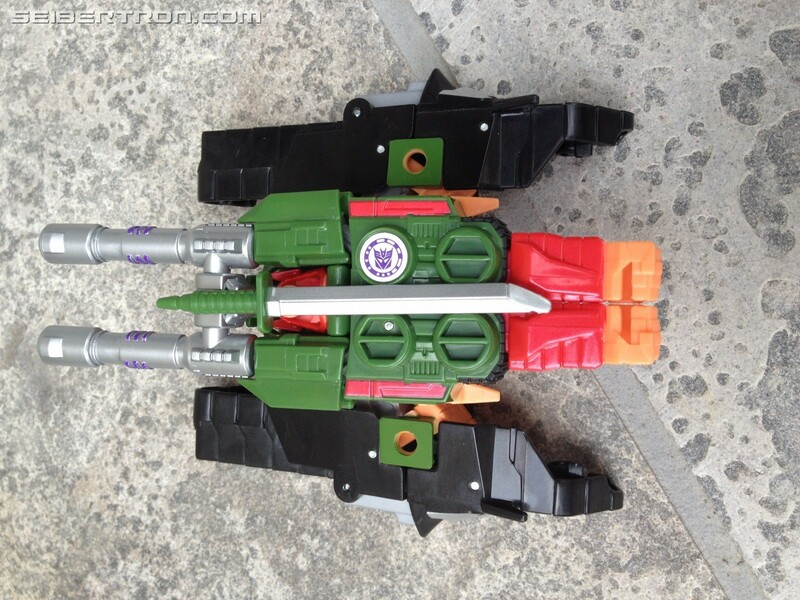 Speaking of those peg holes, they work perfectly for the sword and are actually painted green so that they can match the end of the sword making it resemble a scabbard for the weapon. Speaking of the weapons they are both very well painted with the sword blade painted fully in silver and the same for the cannons which are all in silver aside from some very intricate purple detailing on the sides. 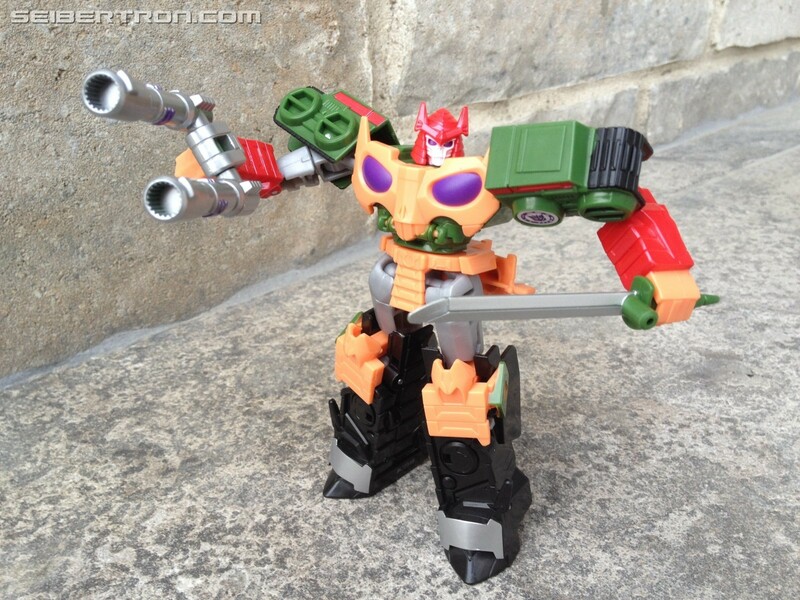 I like the look of the robot mode, he looks like a force to be reckoned with. 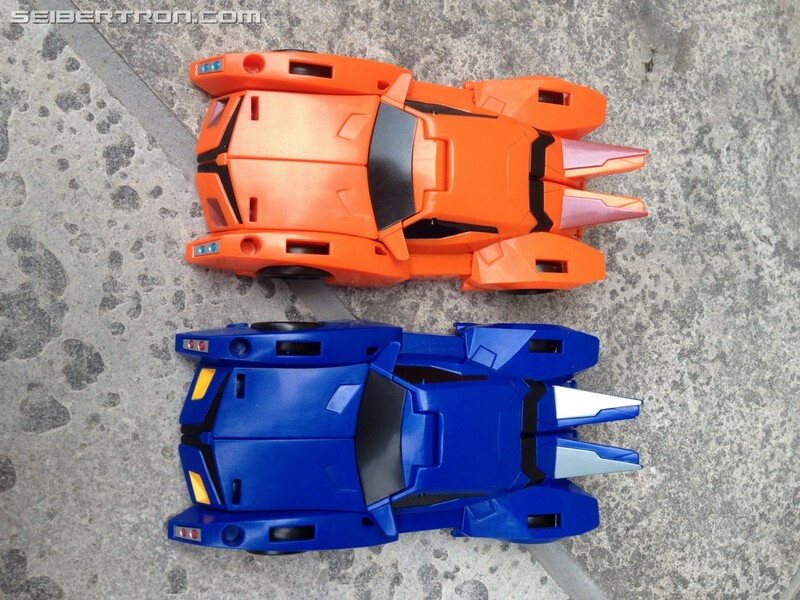 My main problems with this toy come from the alt mode and how the robot parts are (not) hidden. Firstly you have the arms and while I do very much like the paint on them (it's a gorgeous red) I do not like how the hands stick out. 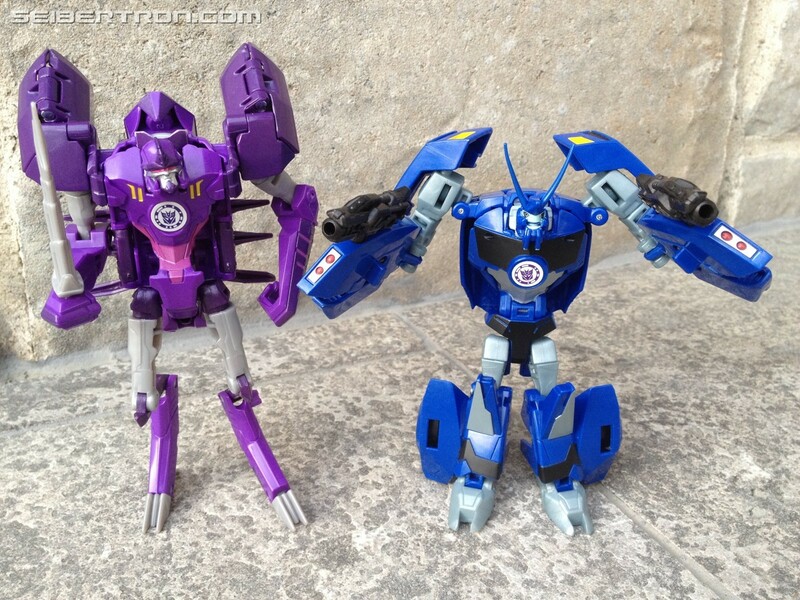 It is very similar to the problem we have with Soundwave (though I admit I adore transforming both these toys, they have dynamic and fun yet chunky transformations). 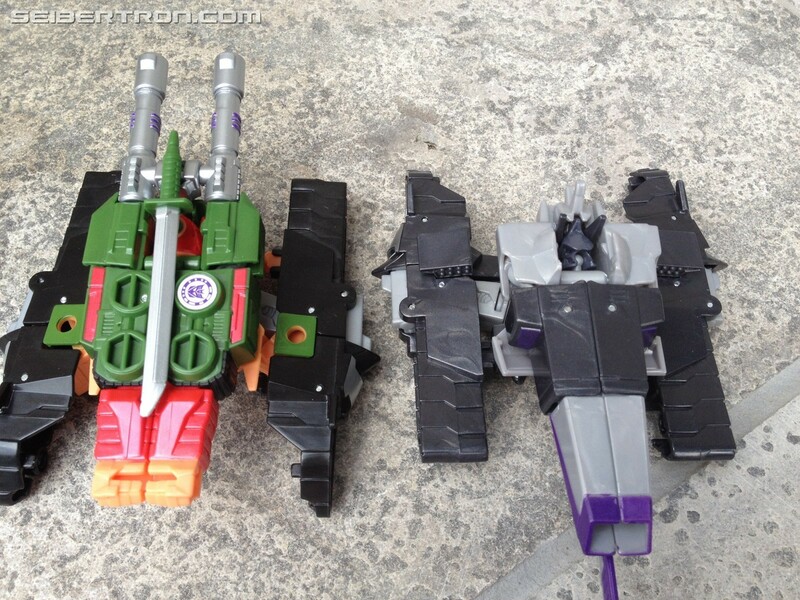 Megatronus had the extra step/piece which made you able to hide the hands inside the arm so this is a step back. 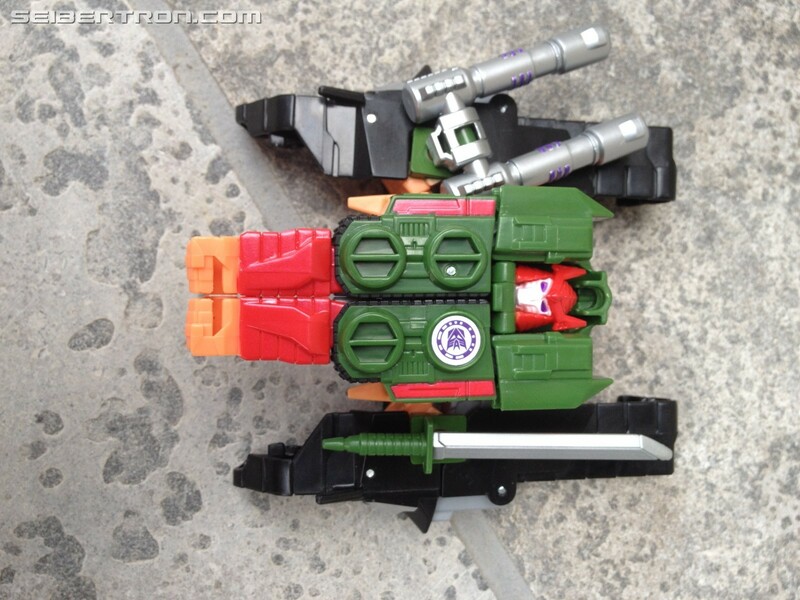 Another robot part which is very noticeable is the head now sadly I would have thought that putting the sword on top of the alt mode was optional weapon storage but it is not. If you want to hide the robot head the only way is to use the sword. However I must admit it does not look terrible and hides the head quite well. 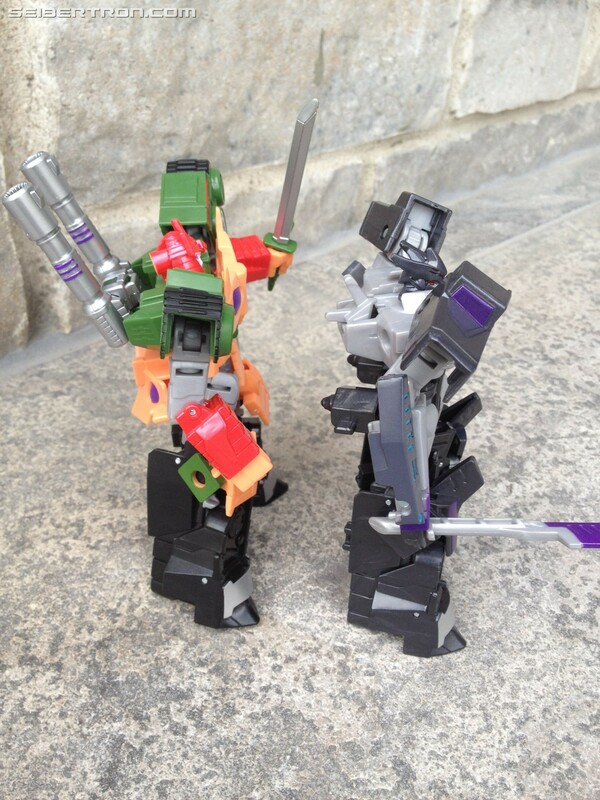 The holes on the legs that imitated a scabbard are still useable in this mode and can be used for any 5 mm port weapon. 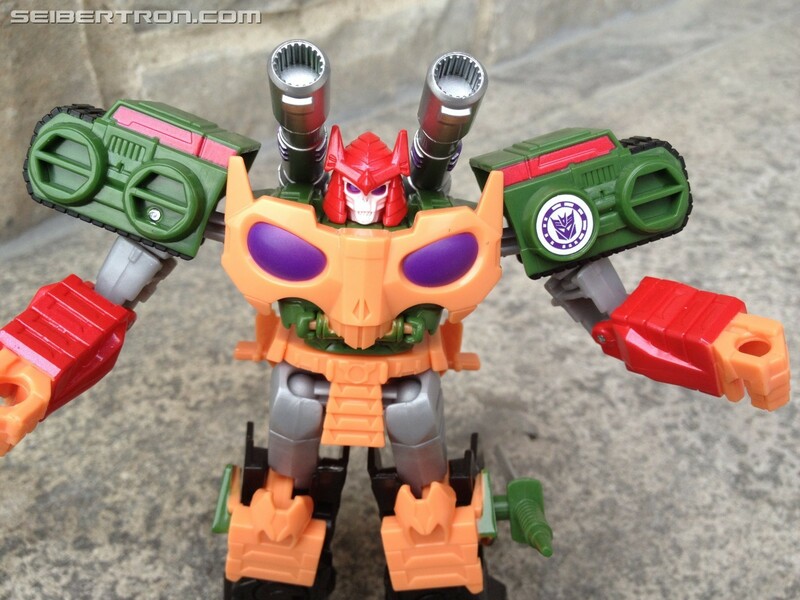 In the end, even with its flaws, I still find this very well-done toy and I think any fan of Bludgeon will be pleased, especially wth the headsculpt and homages to previous versions. 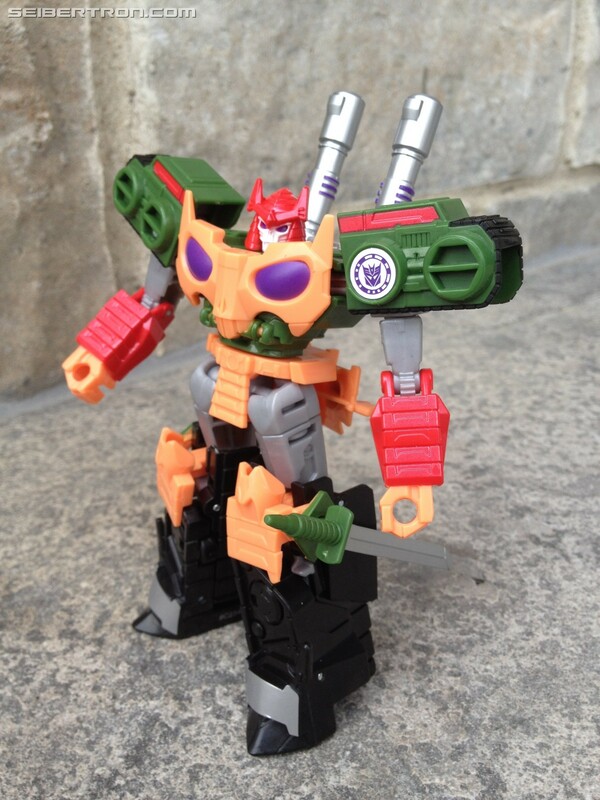 The paint is well applied and the colour variation is perfect and it is fun to now have a fully articulated deluxe sized Bludgeon. It's pretty cool to think that one could now make a top 5 list of Bludgeon releases. What do you mean? 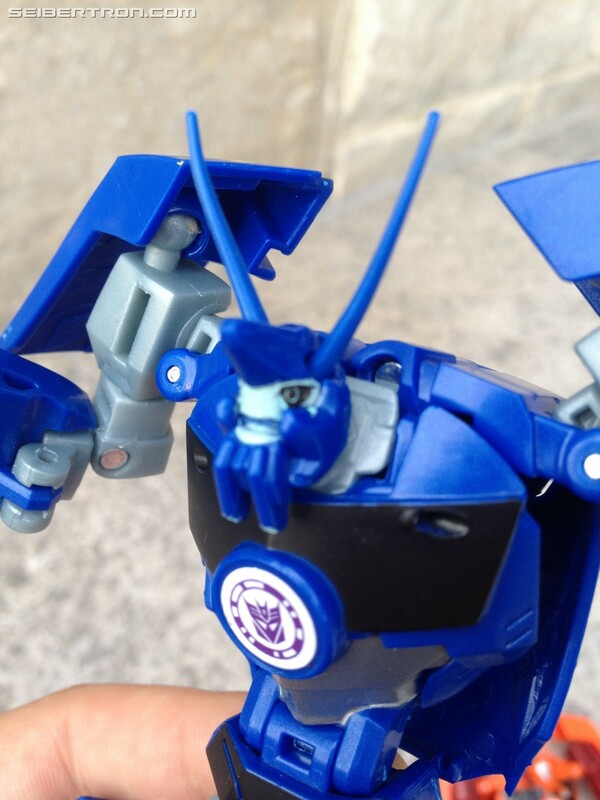 The tiny pegs connecting the face, eyestalks, and antennae on broke off with the face, the neck piece was always lock in correctly. I think this one will fair better with a smaller face, but I'm not sure. Oh sorry, I didnt know you meant it broke, I thought you meant it popped off. I wouldnt know then. My Bisk never broke off and I have transformed Thermidor a bunch with no issues so far.